Snow chains, or tire chains, provide additional traction when road surfaces are slippery or snow-covered. Although snow chains can prevent accidents, they also can damage roads and cars, so many states restrict or prohibit their use. Snow chains are legal in New Jersey in certain circumstances. New Jersey Statutes Title 39:3-73 states that snow chains "of reasonable proportions" may be used when road conditions warrant. These conditions include rain, snow, ice, oil and construction. The law specifies that chains cannot be used "at any time on improved highways when highway conditions do not make such use necessary for the safety of life or property." In other words, chains must be removed when road conditions don't require their use. New Jersey law also states that chains cannot be built or installed in a way that may harm any person or property if they are thrown from the tires. When using snow chains, put them on your tires according to the manufacturer's directions. While driving, don't driver faster than the snow chain manufacturer recommends and accelerate and decelerate slowly. Don't drive on a broken chain; if the chain breaks while you're driving, stop immediately to repair it. Remove chains as soon as road conditions no longer warrant their use. Ackerman, Anne. "Are Snow Chains Legal in New Jersey?" 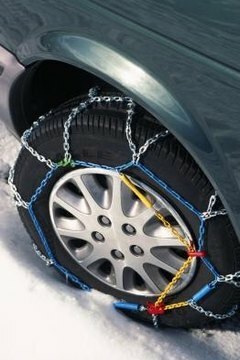 , https://legalbeagle.com/8583704-snow-chains-legal-new-jersey.html. Accessed 24 April 2019.